Bicolor ‘Fashion Queen’ contrasts bright apricot standards against violet purple falls with tangerine beards. Pests/Diseases: The Iris borer, the worst pest of these lovely plants, overwinters as eggs in spent leaves, so don’t give the critters a hiding place. The borers emerge in the spring as tiny caterpillars, which spend a couple of weeks boring through the leaves down into the rhizome, where they grow fat and cause great damage, often leading to soft rot that causes even more damage. Vigilance can help—it’s actually possible to kill the borers in situ if you catch them early enough. You’ll see vertical streaks in the leaves; that’s your guide to help you squash the pests. 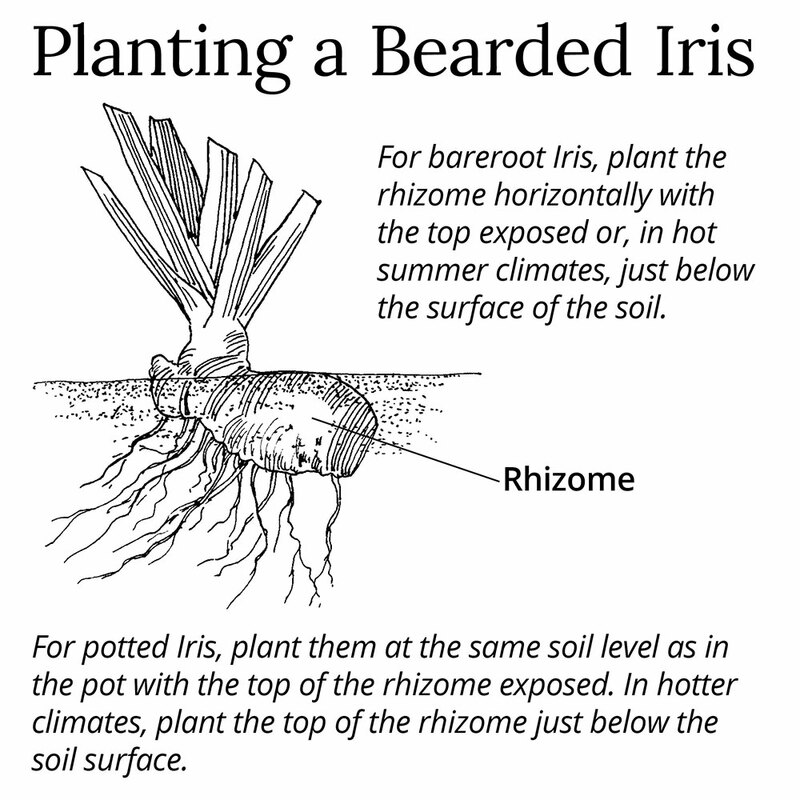 If you see any signs of rot in the rhizome, dig it up and remove the affected parts. Unless the infestation is severe, plants usually recover, or grow lustily enough that you can salvage healthy chunks to keep growing. The rhizomes may also become infected with soft rot. Well-drained soils are important, so add sand if your soil is heavy and plant so that the top of the rhizome is above the soil line. If soft rot does occur, dig out and discard affected rhizomes and cut away any smaller areas of damage. There are a number of Bearded Iris that have the tendency to bloom gloriously in June, then flower again in late summer and into fall. Our sampler offers an excellent introduction to this worthy group. Dividing/Transplanting: Divide your Irises when the clump becomes crowded and bloom diminishes, usually every 3 to 4 years. 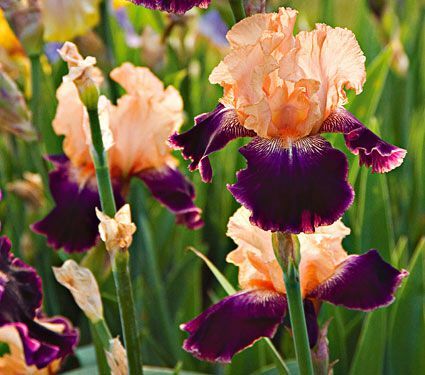 The timing of division is very different than that of most perennials, because Bearded Irises go dormant shortly after flowering, and summer is the ideal time to dig up the rhizomes. 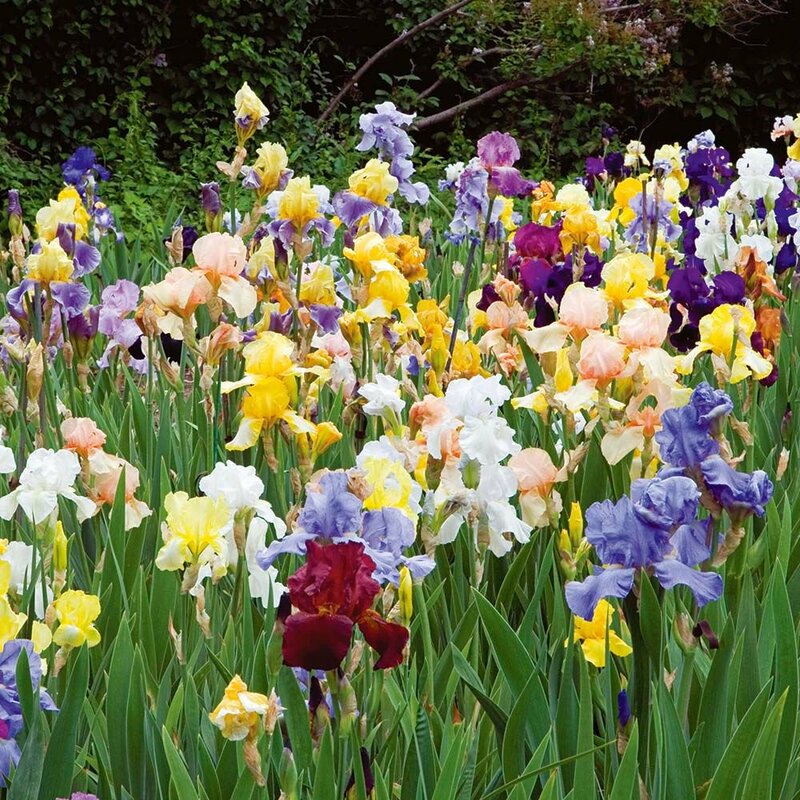 Even though reblooming Irises don’t go dormant, this is also the correct time to divide those varieties. Break the rhizomes into pieces or cut them with a sharp knife. Select divisions with healthy fans of leaves, most likely from the outermost part of the plant. Discard the crowded interior pieces, and any that show signs of soft rot; dispose of these in the trash, not in the compost. This is the time to trim the leaves back to about 6 inches in length. Some gardeners like to dust the cut surfaces with powdered sulfur, or to dunk rhizomes in a solution of 1 part bleach to 10 parts water. We haven’t found this step necessary, but it might be advisable if you have had problems with rot. Replant promptly. You will probably find yourself with extra divisions you can share with friends. 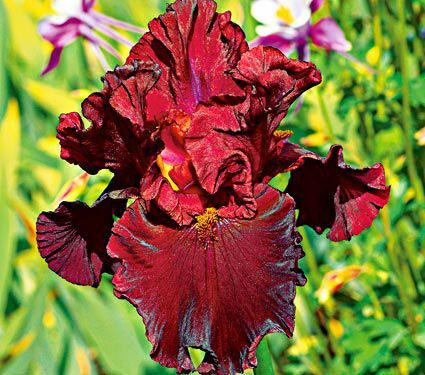 Introduced in 2008, Tall Bearded Iris ‘Raptor Red’ brings luscious color to the June garden. Its well-branched stems hold plenty of these bicolor red blooms with a dab of mustard on their beards. Mid-Spring: Watch vigilantly for the telltale signs of Iris borers in the foliage — dark vertical lines that may appear watery show up in the leaves. Squash the bugs where they live; if infestation is severe, remove affected foliage completely and destroy. 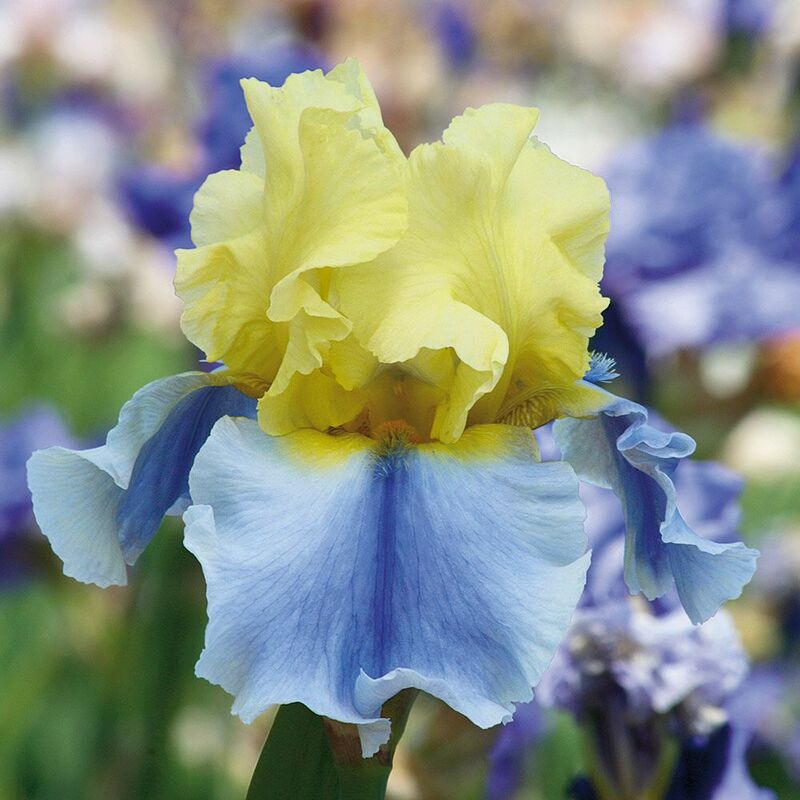 Pastel shades of yellow and blue combine in Iris ‘Easter Candy’.